- Prominent and distinguished leader of India, during India's independence struggle in the early 20th century. - Creator of "Satyagraha" movement, which is a form of resistance based on civil disobedience and non-violence, leading to India's independence in 1947. - Inspired several civil rights movements and freedom struggles across the world, and his birthday, October 2, being honored worldwide as the International Day of Non-Violence. What is Inspiring about Mahatma Gandhi's Life Story? Mahatma Gandhi was the first to employ non-violent civil disobedience as a form of political struggle, that successfully lead a nation to its freedom. He achieved this by galvanizing the nation with several legendary movements like Non-cooperation movement, Dandi Salt March and Quit India movement. 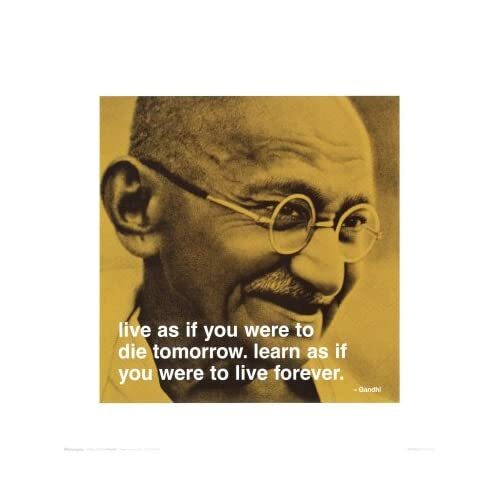 In spite of great difficulties and years of imprisonment, Gandhi held on to his ideals - speaking truth under all circumstances, practicing non-violence, and embracing the simplest possible lifestyle by curtailing unnecessary expenses. And that is something each of us can try to inculcate in our own self improvement journey - if there are principles or causes or ideals that we believe in - stick to them, follow them through, and become a source of inspiration to others! Gandhi inspired several leaders and revolutionaries across the world - most notably Dr. Martin Luther King, Jr. who pioneered the civil rights movement in the U.S., and Nelson Mandela who led the anti-apartheid movement in South Africa. You can find a lot more information about Mahatma Gandhi in his autobiography titled The Story of My Experiments With Truth.